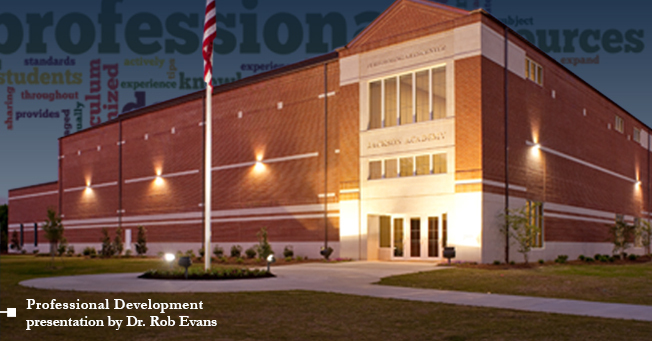 As JA was wrapping up for Spring Break March 5 and 6, the Jackson Academy faculty and staff heard presentations by Dr. Rob Evans, a clinical and organizational psychologist and Executive Director of The Human Relations Service in Wellesley, Mass. He spoke in the Performing Arts Center on the theme of change in education. Dr. Evans addressed nationwide educational change and current cultural challenges, as well as how these changes specifically affect independent schools and the families within independent schools. He gave faculty and staff strategies for addressing change in independent schools. A former high school and preschool teacher, and for many years a child and family therapist, he has consulted in more than 1,700 schools throughout the U.S. and internationally, working with teachers, administrators, and boards, and speaks widely at educational conferences. Dr. Evans received his undergraduate degree from Princeton and his doctorate from Harvard. His interests have focused on change and resistance to it in schools and organizations, on the challenges of leading innovation, and on changes in American families and their impact on schools. He is currently concentrating on ways to improve collegiality and candor among educators and to promote realistic dialogue about accountability. He is the author of many articles and three books: Seven Secrets of The Savvy School Leader, The Human Side of School Change, andFamily Matters: How Schools Can Cope with The Crisis in Child Rearing.